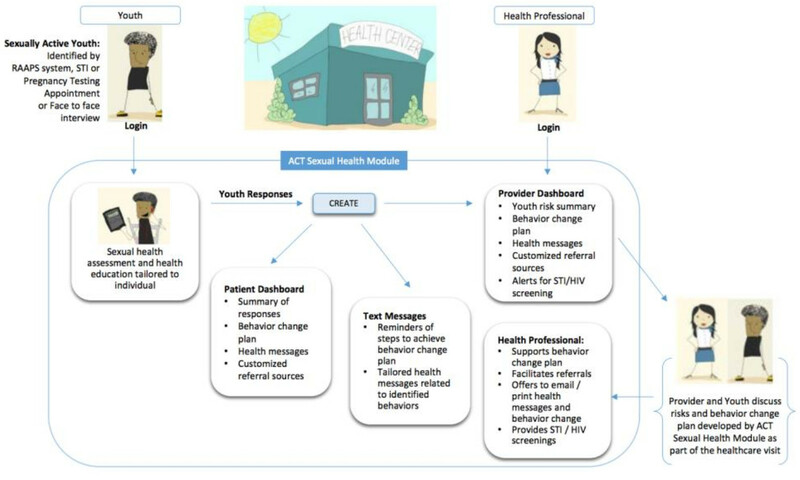 Marrying technology and science, ACT is a behavioral health intervention delivered via a virtual health educator. RAAPS age-specific comprehensive assessments are tailored to older child (9-12 yrs), adolescent (13-18 yrs) and young adult (18-24 yrs). RAAPS Public Health: Developed in partnership with the American Public Health Association enhancing the RAAPS assessment to further identify youth most at risk for school drop-out, based on factors such as discrimination, abuse, and access to tangible needs (food, water, electricity). On a tablet, smartphone or other technology, teens respond to a set of questions that identify risk behaviors in either sexual health or tobacco use. 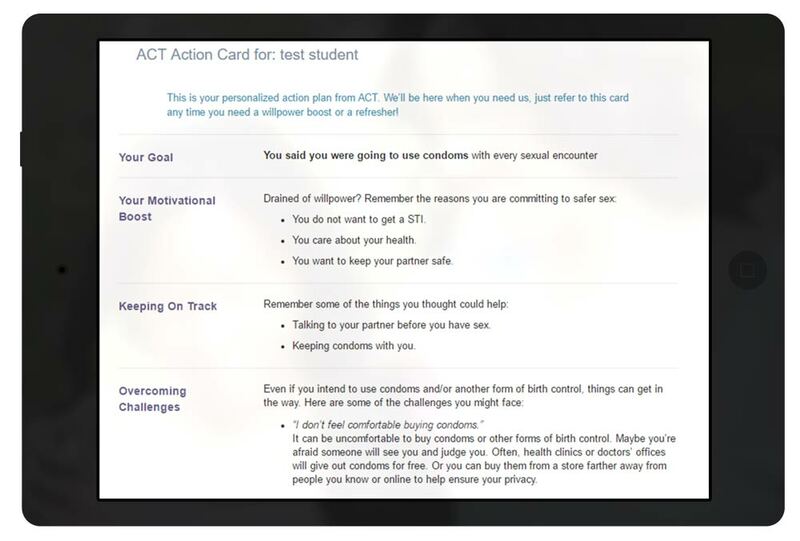 Through the module, users participate in interactive, tailored, evidence-based counseling for safer sexual behaviors or decreased tobacco use. Comfort and confidentiality. Youth can sometimes feel uncomfortable responding to face-to-face questions about their sexual behaviors or tobacco use. Numerous studies confirm that youth are more honest about their behaviors when using technology with no judgmental faces or tones coming back at them. Engagement. Technology offers interactivity and individualization that increase engagement. Ongoing support and text communication. Teens have high cell phone ownership and a preference for text communication. Studies confirm the effectiveness of text messaging to support identified behavior changes. Real-time, prioritized insights. At-a-glance data dashboards allow more focused and effective discussions, as well as ease of tracking and documentation to support ongoing behavior change. Want to learn more? Watch ACT webinars led by Dr. Jennifer Salerno. Our goal is to provide the highest quality services for the lowest possible price to maximize our value to you. RAAPS, ACT or Motivational Interviewing’s pricing structure is dependent on several factors. Click here for a pricing quote individualized to your needs. Number of health centers/schools/practices that you have that would use the assessment?